The tragedy of orange peel and how to fix it. Army Painter Dragon Red Alternative? It was not me! It was the one armed man! I would really like that Odin. I look forward to it if you do get a chance sometime. I know that freehand can really transform those flat and dull surfaces quite a bit. I am not afraid to put in the time either. I actually really love to paint. So, thanks in advance when you get the opportunity. In answer to your question. If you have an art supply store of any kind they might have Grumbacher. I use the matte varnish for sealing. It is intended for oil and acrylic paintings but it actually works great for minis too. Just make sure you give each layer good time to dry. Thanks everyone for your comments! I took more photos of this guys and cropped them down for the Reaper inspiration gallery. They approved them! 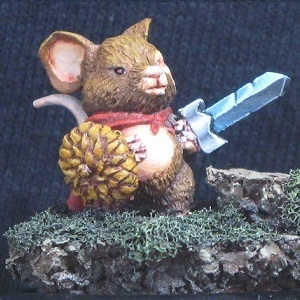 So if you want to see different photos of this guy you can check out the inspiration gallery and just put "mouse" in the search engine. I did this mostly because I wanted more detailed photos that you could see the reds better in. They turned out great, so I thought why not? I am totally stoked that Reaper put them up. Thanks Reaper!